Typhoon Haiyan ripped through the Philippines on Friday, devastating thousands of homes and lives. 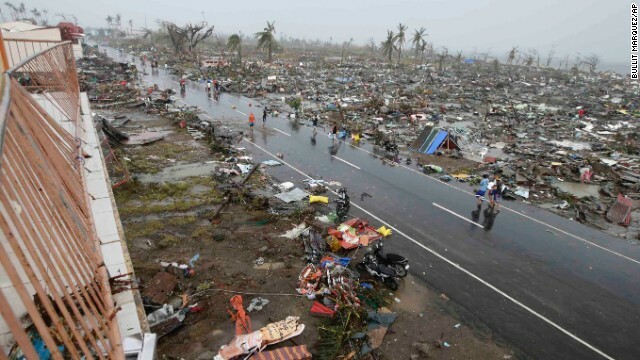 The super typhoon destroyed 70-80% of the structures in its path, displaced more than 600,000 people, and may have killed an estimated 10,000. I’d like to call on everyone to open their hearts and help in whatever way they can. I’ve listed some of the ways you can reach out and help the typhoon survivors below. The Department of Social Welfare and Development (DSWD) is accepting donations at their National Resource Operations Center (NROC), located at NAIA Chapel Road, Pasay City. You can contact Roel Montesa at +639263469927 or roelmontesa@gmail.com, and Elma Pille at ecpille@dswd.gov.ph. They are also looking for volunteers to help with the repacking of relief goods at DSWD-NROC. You can call +63851-2681 to volunteer. They are also accepting cash deposits through the DSWD Landbank of the Philippines account Nos. 3122-1011-84 (Current), and 3124-0055-81 (Savings), or by contacting Fe Catalina Ea at 09186281897. Gawad Kalinga has activated Operation Walang Iwanan to help the typhoon survivors. They are calling on everyone to donate and volunteer at relief centers and schools around Antique, Cebu, Iloilo, and Negros Occidental. ABS-CBN Sagip Kapamilya is accepting in cash or in-kind. You can drop off in-kind donations at the Sagip Kapamilya Warehouse, #13 Examiner Street, West Triangle, Quezon City. For cash and check donations, visit the ABS-CBN Foundation Inc. Building at Mother Ignacia Avenue corner E. Lopez St. Barangay South Triangle, Quezon City (Tel. no. +632-411-4995/+632-415-2272 loc. 3765). I personally recommend sending cash donations to the Philippine Red Cross (PRC). You can contact PRC to arrange a pick-up, or send check (payable to The Philippine Red Cross) or cash donations to the PRC National Headquarters at Bonifacio Drive, Port Area, PO Box 280, Manila 1018. You can also give your cash or check donations to any Cebuana Lhuillier Pawnshop or 7-11 store nationwide. Check these other posts to for more information and other ways you can help. Let’s all do what we can and keep the thousands affected by this calamity in our thoughts and prayers.